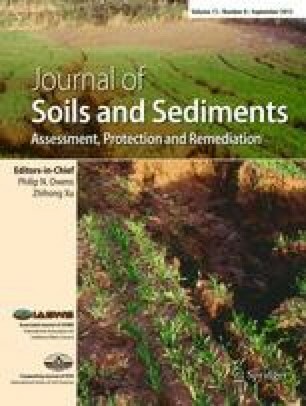 Soils and sediments in certain mining regions of Brazil contain an unusually large amount of arsenic (As), which raises concerns that mining could promote increased As mobility, and thereby increase the risks of contaminating water supplies. The purpose of this study was to identify the most important factors governing As mobility in sediments and soils near three gold-mining sites in the State of Minas Gerais, Brazil. Surface and sub-surface soil samples were collected at those sites and characterized by chemical and mineralogical analyses. Oxalate (Feo) and citrate-bicarbonate-dithionite (Fed) iron contents were determined by atomic absorption spectroscopy (AAS). Arsenic mobilization was measured after incubating the samples in a 2.5 mM CaCl2 solution under anaerobic conditions for 1, 28, 56, 84, or 112 days. The solution concentrations of As, Fe, and Mn were then measured by inductively coupled plasma-mass spectrometry (ICP-MS) and AAS, respectively. Results indicated that As mobilization is largely independent of both the total As and the Feo/Fed ratio of the solid phase. Soluble As is roughly controlled by the Fe (hydr)oxide content of the soil, but a closer examination of the data revealed the importance of other highly weathered clay minerals and organic matter. Large amounts of organic matter and a low iron oxide content should favor As leaching from soils and sediments. Under reducing conditions, As is mobilized by the reductive dissolution of Fe and/or Mn oxides. However, released As may be readsorbed depending on the sorptive properties of the soil. Gibbsite is particularly effective in adsorbing or readsorbing As, as is the remaining unreduced fraction of the iron (hydr)oxides. In general, low soluble As is related to the presence of gibbsite, a large amount of iron oxides, and a lack of organic matter in the solid phase. This has environmental significance because gibbsite is thermodynamically more stable than Fe oxides under anaerobic conditions, such as those found in waterlogged soils and lake sediments.